Books are very powerful. They have changed people’s lives ever since they were invented; they have changed the world. The Power of Now is the single most powerfully life-changing book I’ve ever found. I’ve spent a large part of my lifetime trying to discover the wisdom of the ages and translate it into words I could understand and realize in my life. And that’s exactly what Eckhart Tolle has done in The Power of Now: it’s a translation of the most brilliant, deepest teachings of all great traditions, East and West and indigenous and everything else, into words we can understand in a way that affects every moment of our lives. It is the greatest book I’ve ever read (or published). I haven’t been able to finish it yet. (I told that to Eckhart — he thought it was funny.) I have to read it very slowly, because certain phrases keep stopping me, and I have to think about them. It’s not a book to read straight through; it’s a very precious thing, and to receive its gifts, we have to stop and ponder and sit with the words and see how they impact our life experience. Think about it: The light that bathes us every moment of the day is love itself. That’s worth remembering every time we become aware of the sunlight — it’s constantly there, throughout the day, whether it’s cloudy or clear. That light is love itself. That’s it in a nutshell. Think about it. Remember it throughout the day if you can. 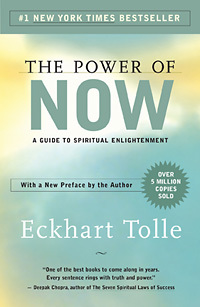 We are giving away three free copies of The Power of Now. To be entered in the drawing for your chance to win, please leave a comment here, or visit us on Facebook and leave a comment under the post about the book. Entries must received by Friday, October 10th. Marc Allen is a renowned author, composer, and speaker. On the day he turned thirty, Marc cofounded New World Library with Shakti Gawain, and as the company’s president and publisher, he has guided it from a small start-up operation with no capital to become one of the leading publishers in its field. He has written numerous books, including The Magical Path, The Greatest Secret of All, and Visionary Business.